Search results for: "anne born"
We asked the 97 contributors to the Nancy Drew Anthology (Silver Birch Press, October 2016) to send photos featuring the book in their home environments. Author Anne Borne provided this portrait of herself and the collection from the ever-wonderful New York City. Anne contributed the story “It’s Not the Books, It’s the Library” (featured below) to the 212-page anthology. It’s easy to identify the Nancy Drew and Dana Girls mysteries as my favorite children’s adventure stories. When I read those little books, I wanted to be the one with the answer, the one to solve the crime, the one to show the grownups that this teen could do it. These girls were resourceful and clever. What’s interesting to me now is that, for the life of me, I cannot recall a single episode, and I couldn’t name more than one title. I do not remember just exactly what these plucky heroines accomplished. What I do remember is my cousin Diane. Diane was much older than me. She was a child of the 1940s whose father served in WWII. She spent countless hours with my grandparents and her aunt and uncle, laying a foundation of trust and love for all of the cousins to follow. We all knew that we were important, and we knew that our family had something special—and a good bit of that came from the first cousin on the scene: Diane. I came to know Nancy Drew because Diane collected the books. As far as I can remember, it was a complete set. I could borrow them, read them one at a time or a couple at a go, and return them to her collection. But it was never about the plot of the books, it was that Diane could read and when she did, she did it up in style. I could take books out of the town public library certainly, and I did that nearly every week I was in school. But Diane had a library and that was exciting to me. Because my family did not have a budget line for book buying or the means to get to bookstores very often, and because I spent so much time at the library, I have only a dozen or so books from my childhood. I do not have all the great pirate books that I loved. I don’t have the stories of Pompeii that I remember so clearly. And I don’t have the Nancy Drew books. I vowed that when I had my own children, I would buy them books instead of just taking them to the library. I wanted them to know what Diane must have known, that there is tremendous comfort in being in a library, but there is something so much more powerful in owning a library. Diane left us a few years ago. She had a heart ailment that would take her from us way too soon. In writing this, I am sad she doesn’t know the lifelong impact her choice in teen fiction had on me. I want her to know that her collecting Nancy Drew and Dana Girl mysteries, and sharing them the way she did, instilled in me a love of libraries as well as a love of a great mystery story. My library has books about everything! I’m reading my own copy of The Daughter of Time by Josephine Tey now with my book club and even though it does not feature a boyfriend with a slick convertible or helpful aunts and uncles, it does remind me of the debt I owe to my cousin Diane. It’s great to have a library card, but it’s even better to have a library. ABOUT THE AUTHOR: Anne Born is the author of A Marshmallow on the Bus (2014), Prayer Beads on the Train (2015), and Waiting on a Platform (2016). She is the editor of the award-winning anthology of stories from The Late Orphan Project — These Winter Months. (2016). Anne is a regular contributor on The Broad Side, and her essay on Hillary Clinton’s religious faith was included in Love Her, Love Her Not: The Hillary Paradox (2015), edited by Joanne Bamberger. Her work has been published in the Newtown Literary Journal and in “Me, as a Child,” “All About My Name,” and “My Prized Possession,” Poetry & Prose Series published by Silver Birch Press. Anne’s essay on her cousin’s collection of Nancy Drew novels was published in the Silver Birch Press Nancy Drew Anthology (2016). Her poetry has been featured in New York at Boundless Tales, Word Up Community Bookstore, and the Queens Council on the Arts. She has been a featured performer in several venues with Inspired Word NYC, at the New York Transit Museum, on Queens Public TV in “The World of Arts,” and with the International Women’s Salon on Salon Radio. Anne divides her time between New York and Michigan, and the Camino de Santiago in Spain. Follow Anne Born and The Late Orphan Project at The Backpack Press, and on Twitter, Redbubble, Wattpad, andInstagram @nilesite. Listen to her in the Bronx podcasts on Our Salon Radio. AUTHOR’S PHOTO CAPTION: This is me at the subway station in my neighborhood, the beautiful South Bronx. Snapped by a girl walking by who saw me balancing my cell phone and the book. She says, “Wow! I love Nancy Drew!” So I gave her the book. Is not a full dinner served on a bountiful table. Proud grown ups in the back. On a fraying bit of rope. To help write my future. Did you drop this? I think it’s yours. And why I also choose not to look back. AUTHOR’S PHOTO CAPTION: Ultreya! Souvenirs from walking the Camino de Santiago. NOTE FROM THE AUTHOR: If Marie Kondo is right, you should only keep objects that spark joy. I like to keep objects that spark memory — sometimes joyful, sometimes sad, but the object is an agent for memory. For over 1,000 years, pilgrims on the Camino de Santiago have carried seashells to identify themselves as pilgrims — not only to fellow pilgrims but to the great number of people along the road who offer assistance and protection. In May 2009, this shell was picked from a basket of one-Euro shells in the pilgrims’ office in St. Jean Pied de Port, France, traditionally the beginning of the Camino Frances, or French Route to Santiago de Compostela — a journey from that point in the French Pyrenees of over 800 kilometers to the medieval city of Santiago de Compostela in Northwest Spain. I’ve carried this shell with me on four shorter pilgrimages in Spain from 2009 to 2014 — only leaving it at home when I walked this past May because I worried I might lose it if I took it on one more hike. It reminds me of the pilgrim on the bike in 2010 who waited for me to catch up to him, offering to carry my backpack on his bike. It reminds me of the woman I met who vowed if she ever became cancer-free, she would walk the Camino. It reminds me of how important it is to be able to step away from your life just long enough to find your life. It reminds me of why we walk — to pray at the cathedral of Saint James, the resting place of the Apostle. The Camino de Santiago is my bliss. ABOUT THE AUTHOR: Anne Born is the author of A Marshmallow on the Bus (2014), Prayer Beads on the Train (2015), and Waiting on a Platform (2016). Her work has been published in the Newtown Literary Journal and in “Me, as a Child” and ”All About My Name” Series published by Silver Birch Press. She is the editor of These Winter Months: The Late Orphan Project Anthology (2016), and her essay on Hillary Clinton’s religious faith was included in Love Her, Love Her Not: The Hillary Paradox, edited by Joanne Bamberger. Her poetry has been featured in New York at Boundless Tales, Word Up Community Bookstore, and the Queens Council on the Arts. She has been a featured performer with Inspired Word New York City, the New York Transit Museum, and on Queens Public TV in The World of Arts. Anne divides her time between New York and Michigan, and the Camino de Santiago in Spain. Follow Anne Born at The Backpack Press, and on Twitter, Redbubble, Wattpad, and Instagram @nilesite. Listen to her in the Bronx podcasts on Our Salon Radio. PHOTOGRAPH: Anne Born in her very own personal district of Barcelona, Spain (2009). ABOUT THE AUTHOR: Anne Born is a New York-based writer who has been writing stories and poetry since childhood. She blogs on The Backpack Press and Tumbleweed Pilgrim and her writing focuses on family and life in a big city after growing up in a small one. She is the author of A Marshmallow on the Bus, and Prayer Beads on the Train. Anne is a photographer who specializes in photos of churches, cemeteries, and the Way of St. James in Spain. Most of her writing is done on the bus. Find out more at www.about.me/anneborn. You can follow Anne on Wattpad, Instagram, and Twitter at @nilesite. Marshmallows toasted over the fires on the beach. ducking in and out of the bushes. Wet swimsuits hang on the line. I can taste the icy too-sweet grape Nehi. and I am heading down to Seventh Avenue now. I wish I remembered how to play Pinochle. 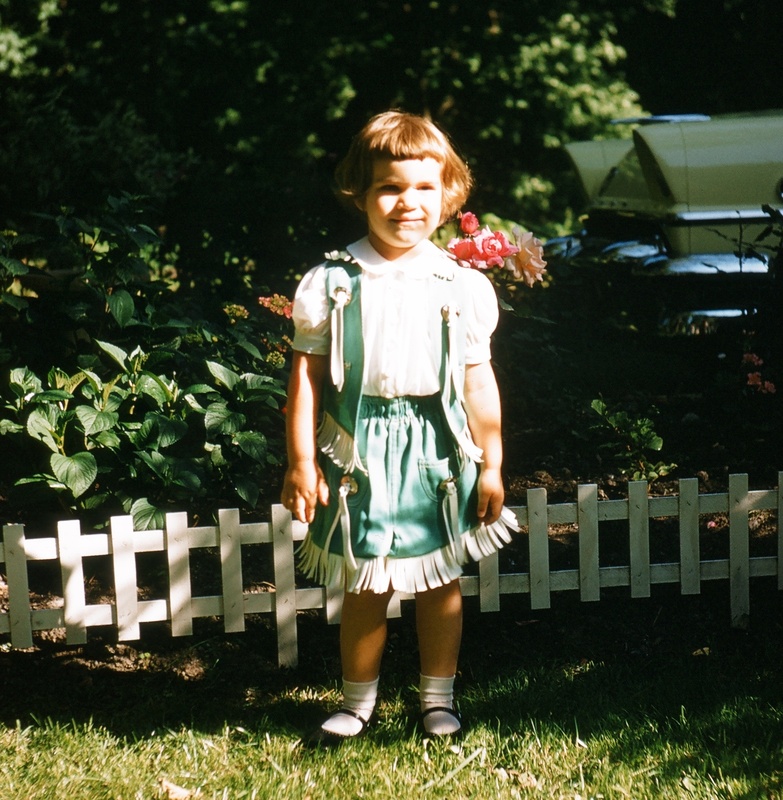 PHOTOGRAPH: The author as a child in her green cowgirl outfit. NOTE FROM THE AUTHOR: I wrote “The Subway by the Lake” on the downtown B train [in New York City] one morning in August 2014. The poem appears in my second collection of stories written on the MTA — Prayer Beads on the Train. It describes the memories prompted by the rush of fresh air into the train car as we pulled into the Columbus Circle station one morning on my way to work. The moment lasted only as long as the train car doors were open — roughly 15 seconds. But I felt refreshed by it and found myself quickly writing down the images on the way downtown. ABOUT THE AUTHOR: Anne Born is a New York writer whose blog posts have appeared on Red Room, Open Salon, Bubblews, and as a feature in Non-Fiction on Wattpad (as Nilesite). She is a regular contributing writer on The Broad Side. Her writing focuses on family and life in a big city after growing up in a small one in Michigan. Anne published her first collection of MTA stories, A Marshmallow on the Bus, in June 2014. Most of her writing is done on a city bus or train. Anne is a performing artist in the Platform Series at the New York Transit Museum and has featured as a Local Poet at Inwood Local, as an author at We Heart NYC Writers sponsored by Inspired Word, and as a poet and storyteller with No Name at Word Up Community Bookstore in Washington Heights. Her poetry has also been featured at Boundless Tales at the Astoria Bookshop in Queens, New York. She is a participating member of Poetry & Coffee. Anne is a photographer who specializes in photos of churches, cemeteries, and the Way of St. James in Spain. Her photos are sold on Redbubble (Nilesite). Follow Anne Born on Twitter and Instagram @nilesite and at http://thebackpackpress.com and http://tumbleweedpilgrim.com. until I’d practiced changing a tire three times. to maintain properly my car. I still have that card. that belongs to his hand. the Nascar he was watching. Out of Seattle, not Indy, he told me. I’ve ever had with dad. He asked about the brakes on my G6 Pontiac. the amount the shop shaved off. I knew his mechanic’s vocabulary. only charging me eighty for the service. massage this grease into the lines of his hands. trying to dislodge stubborn oil. pressing with elbow grease into the leather. from the front bumper of my Pontiac. AUTHOR’S PHOTO CAPTION: The front and back of the 3 x 5 card my dad gave to me. NOTE FROM THE AUTHOR: Loved this prompt, as it caused me to reflect on what I consider to be “prized” among my possessions. I’ve accumulated tons of stuff over my 57 years, even though I actually consider myself non-materialistic. I have only one possession from my father: a three x five card with directions on how to take care of my car. He gave this to me as I was leaving for college. He was a mechanic. This was important information for him to share with me. ABOUT THE AUTHOR: Marianne Peel taught English at middle and high school for 32 years, and is now retired, doing Field Instructor work for Michigan State University. She won first prize for poetry in the Spring 2016 Edition of the Gadfly Literary Magazine, and. also won the Pete Edmonds Poetry Prize. Her work has appeared in Encodings: A Feminist Literary Journal; Write to Heal; Writing for Our Lives: Our Bodies—Hurts, Hungers, Healing; Mother Voices; Metropolitan Woman Magazine; Ophelia’s Mom; Jellyfish Whispers; and Remembered Arts Journal, and will appear in the fall editions of Muddy River Review and EastLit Journal. The recipient of Fulbright-Hays Awards to Nepal and Turkey, she is a flute-playing vocalist, learning to play ukulele. Raising four daughters, she shares her life with her partner Scott, whom she met in Istanbul while studying in Turkey. She taught teachers in Guizhou Province, China, for three summers, and in January 2016 toured several Chinese provinces with the Valparaiso Symphony, playing both flute and piccolo. 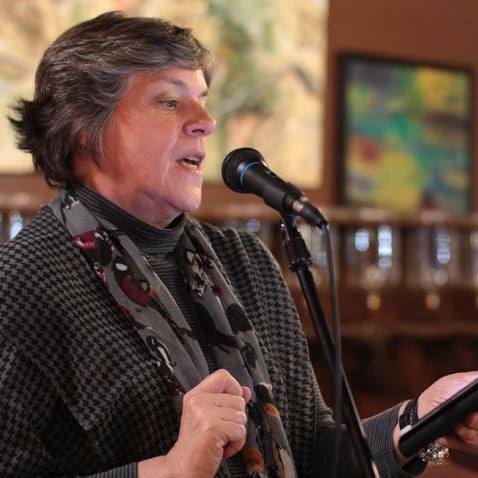 In June 2016, she was invited to participate in Marge Piercy’s Juried Intensive Poetry Workshop. lining her toy box with doll’s clothes, bits of rummage. The red pig’s an Alphabet. It says S is for Snow. Under a baby blanket she tucks two figs from the fig tree. of her clear voice rising, singing something in herself to sleep. just what, as she snaps them shut, she locks outside. this face of bland, not quite amused contempt. Cape Town, November, spring 1955; with winter, England, coming. gate widens, I’m to the street, and running. In the corner park, I lie and watch the sky. Light’s threading through like film. how overnight the grass would limb up round them, thick as a pulse? idly reluctant to lift them free. Dew pearls on the thongs. At my wrist, my chest, my neck, rising like a voice, I feel the sun. like coins clattered to kiss in a wishing well. to the white friends, my brothers. AUTHOR’S PHOTO CAPTION: With my mother and sister on the boat from South Africa to England, December 1955. NOTE FROM THE AUTHOR: I’ve lived in four countries—I’m now on my third nationality—but this first move was the one that marked me the most. Whether I write about it from the Cape Town or the London end of the relocation, there are always the same mixed feelings, of deliverance and loss, of love and longing. A longing that went beyond the personal into the political, the social, the humanitarian. But I suppose it’s mostly the longing of every refugee: the longing to belong again. ABOUT THE AUTHOR: Derek Kannemeyer was born “coloured” in Cape Town, South Africa, but was raised from the age of six in London, England. He lives and teaches in Richmond, Virginia. His work has appeared in a few dozen online and print journals. AUTHOR PHOTO: Spring 2016, Richmond, Virginia. to prevent the lascivious exposure of my navel. in sunny South Africa, on the frolicsome Cape sands? surely I can’t believe I’ve anything much to protect? about the flaws or the perfections of one’s ordinary person. to not gawp at, holding this same shy, brazen pose? PHOTO: Three Kannemeyers on the rocks, circa 1954, Western Cape, South Africa. NOTE FROM THE AUTHOR: The poem that appears here was written to announce an upcoming reading. In the few years since I wrote it, the photograph that inspired it seems to have utterly disappeared. Mmh. But I’ll offer another one, from the same year, I believe, in which you will notice that I am the only one of the subjects who remains decently clad. And unlike my brother and my father, I have my eyes closed: to draw attention, it may be conjectured, to my renunciation of all this unsavory (and yet poetic? rather charming?) self-flaunting of the exposed self. ABOUT THE AUTHOR: Derek Kannemeyer was born in Cape Town, South Africa, raised in London, England, and teaches in Richmond, Virginia. His writing has appeared in a few dozen print and online journals. any and every language! To understand, to be understood! Peter had brought some Dada to rehearsal: L’Amiral cherche une maison à louer. if the device turned gobbledygook lucid, or it went haywire trying. So remember, dear Lucy, how we beamed over to the Tate to check out Dada art? text, pretext, and subtext; gasp, grunt, groan, and chortle! to board your escape pod of burble, impenetrably desolate. In comforting Derek, I clucked and kyorr’ked to you. gigglegabgoo at anyone. King Herod, the Borg, a coatrack, your toes, the stars. IMAGE: Captain Kirk (William Shattner) and Dr. McCoy (DeForest Kelley) listening to Universal Translators in a scene from Star Trek. NOTE FROM THE AUTHOR: Even now, when I forget the words of a song, I’ll sometimes sing in my private glossolalic language, and I’m always gratified when people ask what language, and how come I know the lyrics in it. If I could choose my superpower, it might well be the ability to speak and understand every language. But this poem is about teenage friendship. In which the ability to communicate does sometimes feel like a superpower—even if you’re not actually saying much. There’s this astonished glee of mutual attunement. This belief, for a while (until you learn how much you’ve been losing in translation), that there’s someone else in the world on your wavelength. ABOUT THE AUTHOR: Derek Kannemeyer was born in Cape Town, South Africa, raised in London, and lives and teaches in Richmond, VA. His writing has appeared in a few dozen online and print journals. AUTHOR PHOTO: The writer in his World Languages classroom, 2013. PHOTO: A sunny Sunday morning in the backyard, February 2015. NOTE FROM THE AUTHOR: For years, my hairstylist tried to convince me to dye my hair to cover the silver that was becoming noticeable in my twenties and accelerated through my thirties and forties, but I always declined. I am not the type to fuss with hair and makeup and I loved the silver color that was replacing the dark brown. She said that while men with graying hair look distinguished, women just look old, but I appreciated looking older. After I graduated from college, I was working in music ministry, assisting the organist/choirmaster. When I would be among the treble choir, whose members were in elementary and middle school, people would mistake me for one of them. I appreciated that a touch of silver at my temples might keep me from being confused with 12-year-olds. Times have changed. Now, one of the hottest shades for young women to color their hair is silver. Will I begin to be mistaken for a younger woman again? 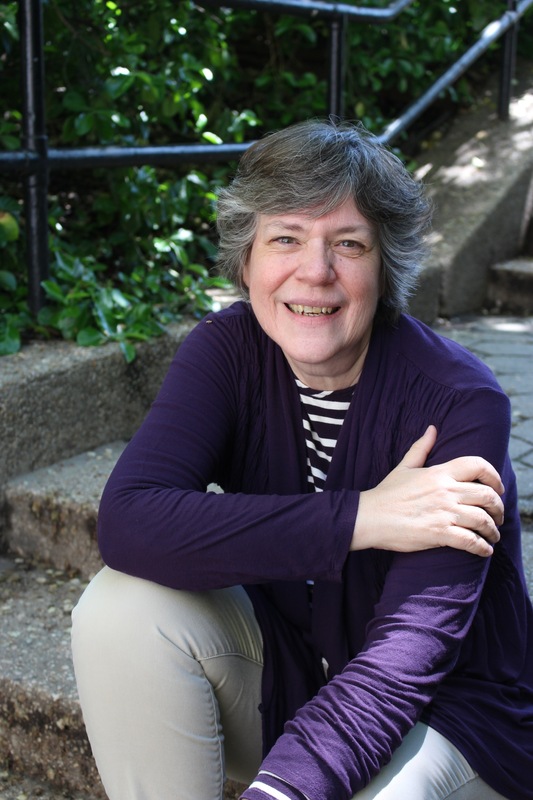 ABOUT THE AUTHOR: Joanne Corey lives and writes in Vestal, New York, where she is active with the Binghamton Poetry Project, Bunn Hill Poets, and Sappho’s Circle. She is pleased to return to the Silver Birch Press blog in 2016 after appearing in five series in 2015. She invites you to visit her eclectic blog, Top of JC’s Mind. who answered to that common name. living out a universal call. 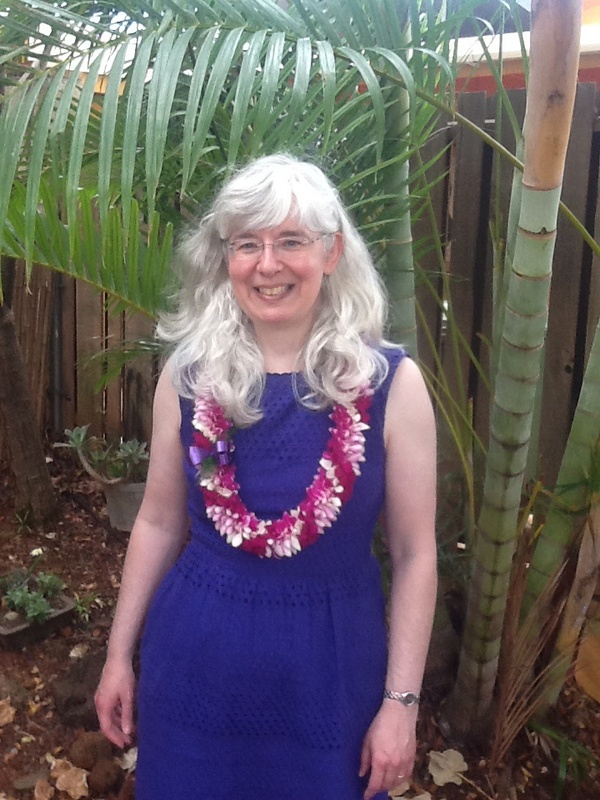 PHOTOGRAPH: The author’s visiting her daughter in Honolulu for Mother’s Day (May 11, 2014). 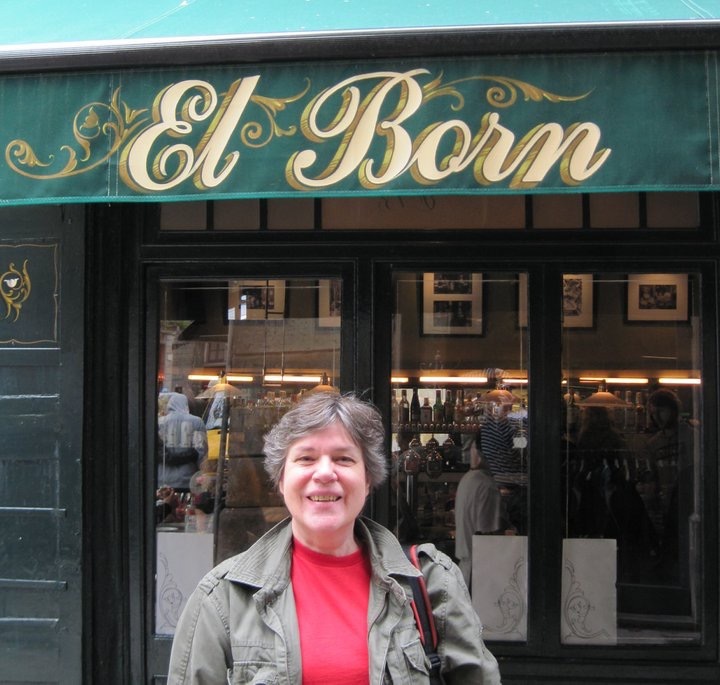 ABOUT THE AUTHOR: Joanne Corey lives in Broome County, New York, where she spends her time writing, blogging, caring for family, volunteering, and tilting at windmills for various environmental and social justice causes. Recent publications include the spring 2015 anthology of the Binghamton Poetry Project and the anthology Candles of Hope (GWL Publishing – UK), her first international print publication. She invites you to visit her eclectic blog: http://topofjcsmind.wordpress.com.